DO YOU REMEMBER which month saw the publication of the Health and Social Care Bill? Or when during the year a flood of new drugs made the Misuse of Drugs Act ‘increasingly unenforceable’? Or when the Centre for Policy Studies’ Breaking the habit report kicked off a row about the cost of drug use to the public purse? Looking back at the recurrent themes and thorny problems makes the year seem very short indeed. The drinks industry is among those appearing constantly in our headlines, particularly in relation to debates on minimum pricing and subliminal advertising. See our review on page 18 for a reminder of a roller-coaster year. As we head towards 2012 it’s a worrying time for all of us, and we are fully aware of budget constraints right across the field. It’s with complete gratitude then, that we thank contributors to our Christmas card appeal (centre pages), who helped towards the production costs of this issue during the traditionally lean period for advertising. 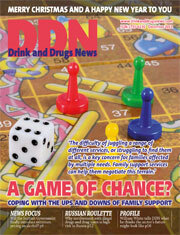 You have firmed our resolve to keep DDN as a free magazine that goes to every corner of the drug and alcohol field. A happy and healthy Christmas to all our readers, contributors and advertisers.